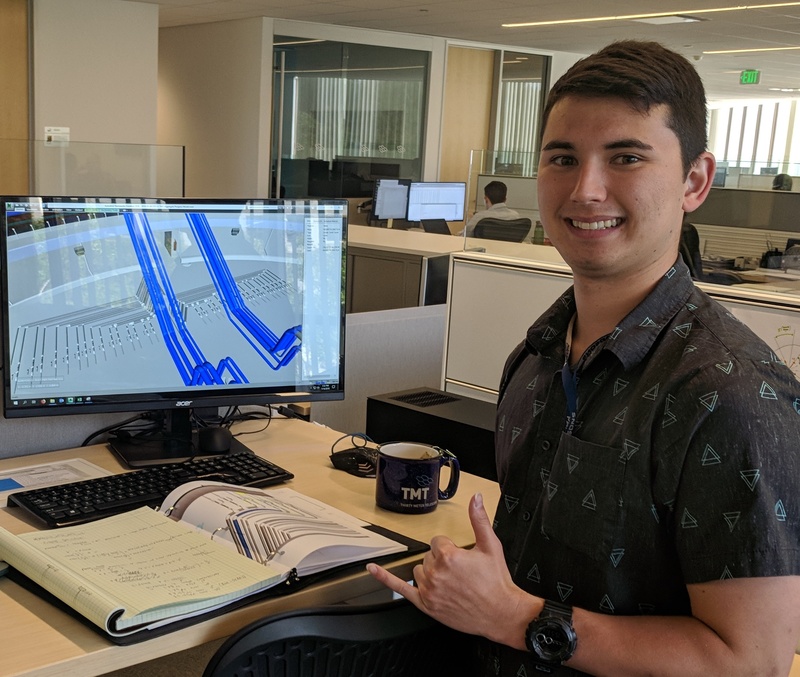 Keoki Massad is a current student at the University of Portland, finishing his degrees in Mechanical Engineering and Computer Science. He is from Honolulu, Hawaii and is a 2014 graduate from the Kamehameha Schools, Kapalama Campus. When he is not in school or running meetings for his schools Tau Beta Pi chapter, he enjoys playing sports and surfing with family and friends. While designing a complex structure such as the Thirty Meter Telescope (TMT), it is important to consider the attributes of the individual components to understand the performance of the system as a whole. Mass is one such attribute that is managed to ensure structural integrity of the telescope. Various utilities are distributed on the telescope, including their pipes, cables, manifolds, power distribution boxes, and cable trays. The purpose of this project is to develop and use a systematic process to determine mass estimates for these distribution items for each floor of the telescope in order to ensure that each floor adheres its mass allocation. An Excel database was prepared to allow the user to input the specific parameters of each distribution item of the preliminary TMT utilities CAD model in Navisworks to calculate and display its estimated mass. With these results, we will present and compare them with the mass allocation budgets. Since the estimated mass for each floor is for the preliminary design, these estimates can be used as a baseline for comparison with the ongoing design. These mass estimates allow TMT systems engineers to manage the comprehensive TMT mass budget and determine if additional components can be added to the structure while still adhering to the mass allocations per floor. Without a baseline weight estimate, it is very challenging to determine if you have to lose weight or not.